So don’t take this as a complaint, it’s more of an amusing piece of correspondence I received after sending in for my $10 rebate. To summarize: to receive my ten bucks I would need to do stuff beyond the regular tedious stuff you have to do to get a rebate. It is hard to believe that you expect me to contact the dealership for an additional documentation in order to receive my $10 rebate after I followed ALL of the required steps “to receive your redemption”, specifically step 2: “Make a copy for your records and attach your original sales receipt (repair order)”. Nowhere does it request that the receipt should have any specific information like part numbers, technician names or anything else. 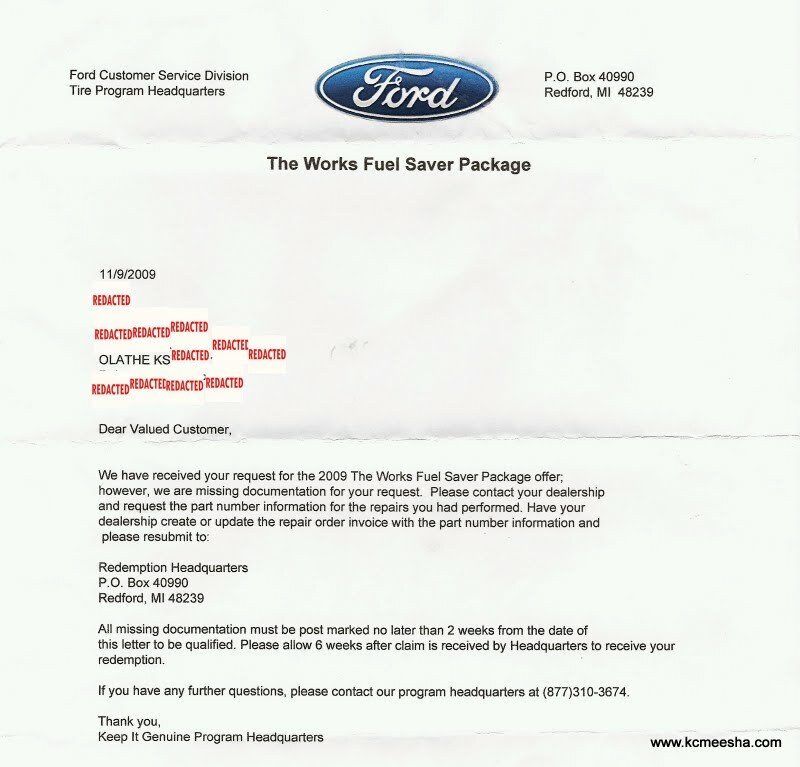 Considering that the page I submitted had a Ford invoice number and Ford dealership information it should’ve been an easy task for one of the Ford employees to obtain this information if it’s so important to you. I am attaching another page from the invoice; hopefully it satisfies your stringent requirements that separate me and $10 your company owes me. Next time please consider including more specific instructions with your rebate forms since you are so particular about the submitted paperwork. I don’t expect to be asked to waste any more stamps and will be waiting impatiently for my redemption.